rom documentary evidence, such as statutes and prohibitions, we get the impression that playing cards were being used in England in the fifteenth century. It is questionable whether these cards were actually made in England from their earliest introduction, so for quite some time they must have been imported. But the 1463 ban on importation leads one to suppose that a domestic industry already existed by this time. Around 1987 I decided to make a pack of playing cards from woodblocks and coloured with stencils. 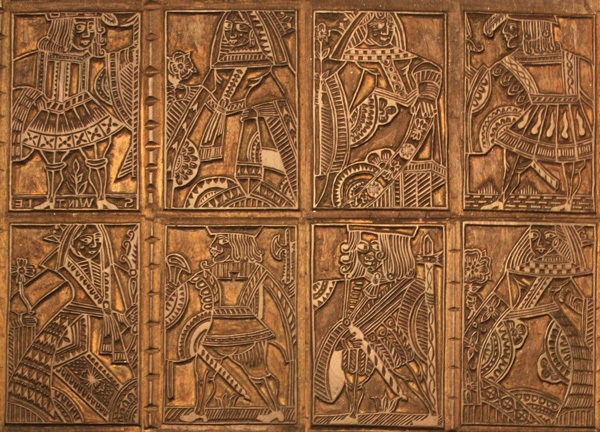 The purpose of the exercise was to acquire insight and practical experience into the circumstantial problems of printing playing cards from woodblocks, their design, colouring with stencils, etc. I was carrying out my 'apprenticeship'. I acquired the necessary blank wood blocks (lime wood) and had them planed flat and made 'type high'. I then discovered that the woodcutting tools which I had acquired for the task were useless, and so I made my own set out of watchmaker's tools, which are made from higher grade steel. Whilst French cards had a tradition of being named after historical personalities, English court cards were never named or based on any historical personalities. The costume worn by the English court pattern came from a French perception of that worn by the monarchy and their attendants, presumably at the time when the designs were first made. This partly explains the strange costumes on the cards, alongside poor copying. in which case the design may become corrupted or modified. English playing cards often look as though this sort of thing has happened. The stencilling is often slap-dash which further obliterates the designs. These reductions in quality are probably due to cost-effectiveness: there is often a sense of expediency. Did this matter? Perhaps the problem was compounded in that they weren't always sure exactly what they were representing. It is ironic that embargos had been secured against imported cards, but that home-produced ones were so badly designed! However, due to the formalisation of the designs, and whether they are called 'packs' or 'decks', today the English pattern has become the leading international pattern. The Americans took it with them and perpetuated it over there, although they introduced innovations including the joker and (probably) corner indices. 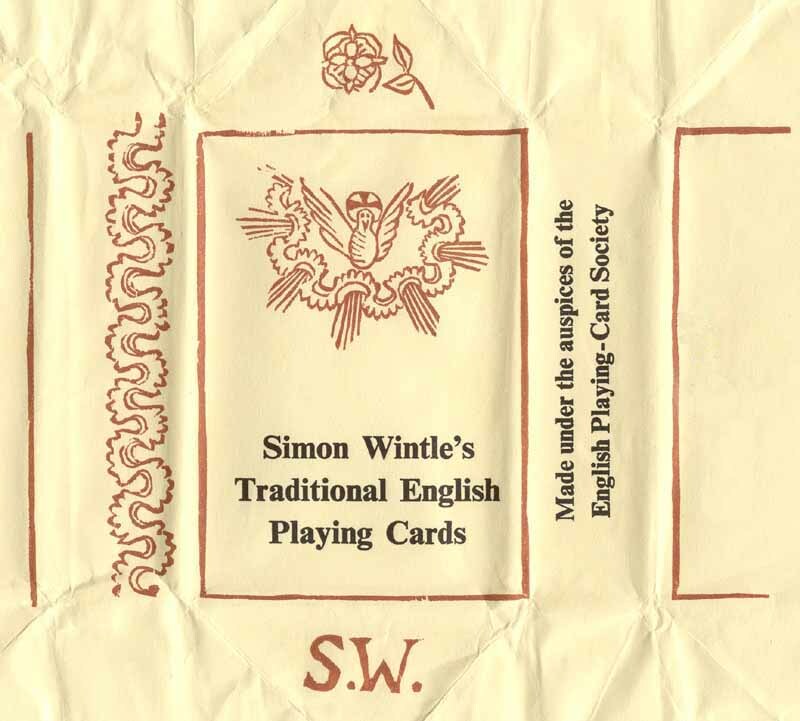 To see more about early English playing cards click here. There is more to making a pack of playing cards than designing and printing the court cards… namely the pip cards. The stencils were made from heavy, oiled card and the pips were cut with punches which I had specially made. I believe that this is how they were traditionally made, otherwise there would have been noticeable variations between adjacent pips had they been cut out by hand. With the benefit of hindsight I can now see where I made mistakes, particularly at the colouring stage. It was fascinating to rediscover why the old card makers did things in particular ways, which may appear odd or eccentric until we try to do it differently. Then we see the logic! The wrappers were printed from woodblocks with letterpress overprinting. The backs were plain white, as they were traditionally presumably for reasons of economy in production. Above: During the stencilling stage, I also tried alternative colour schemes.